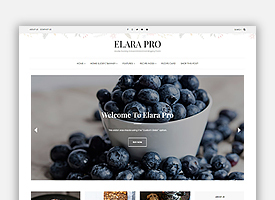 Elara Pro is a stunning, visually captivating, feature packed food blogging theme. It has a sizable collection of useful features, not only giving you multiple ways to arrange your content but also built-in ways you can monetize your website. 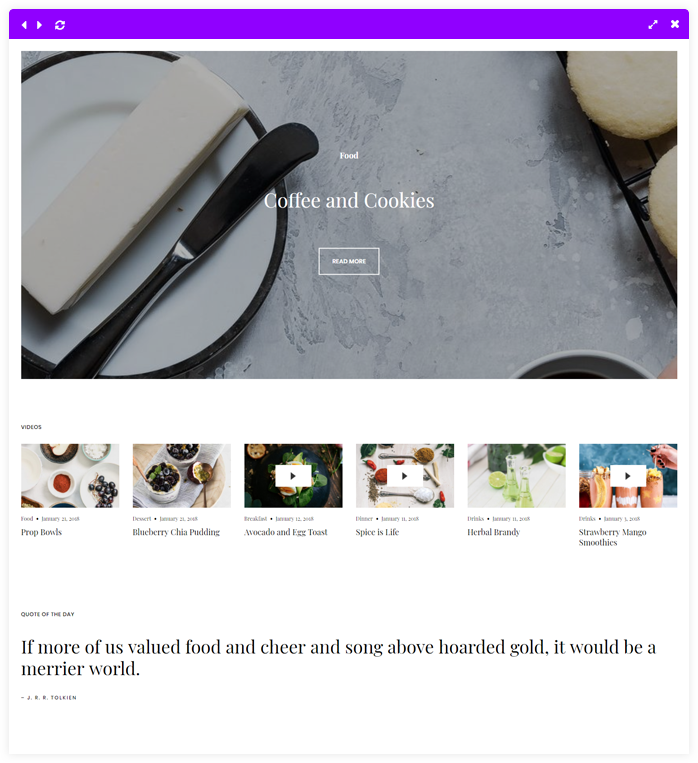 Your food blog look amazing on all screen sizes and devices, and the set up is a breeze! If you prefer to take your photos in portrait mode, then this is the ultimate theme for you. One-time setup fee. Then $7.99/mon for ongoing support & updates - first month is free! Don't want to pay the monthly fee? Cancel your subscription within a month of purchase and incur no recurring charges. More details here. 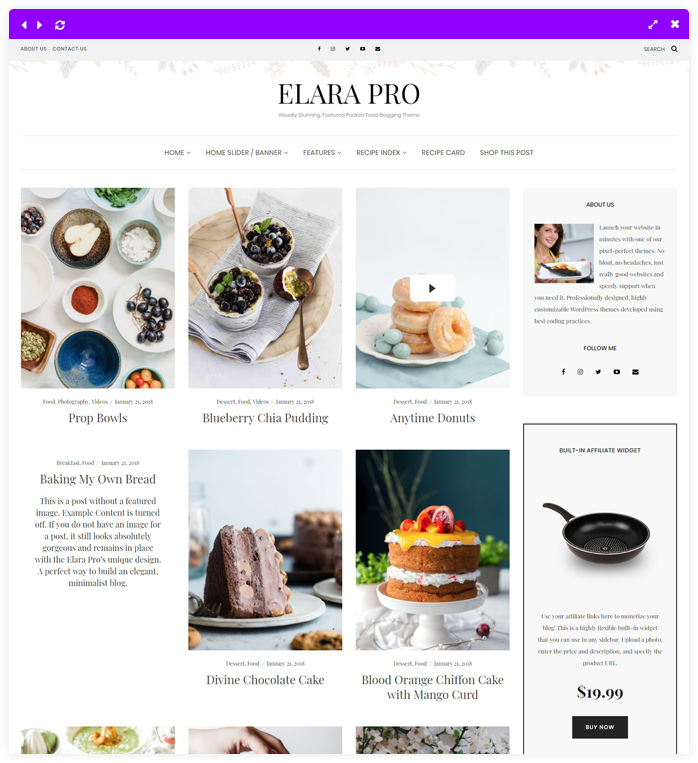 Elara Pro includes everything you'll need to run a successful food blogging website! 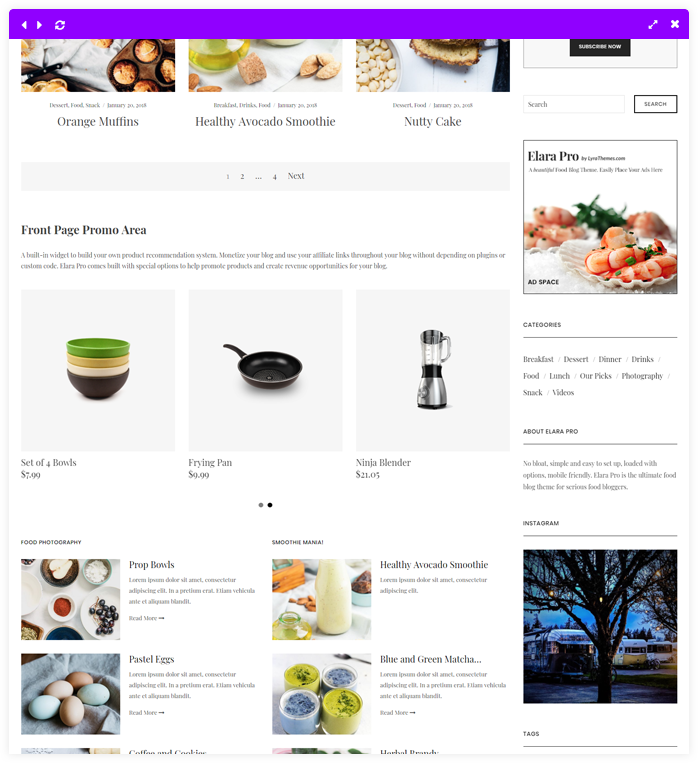 The Recipe Index and Recipe Card come built-in, along with an affiliate or recommendation system that can be utilized to monetize your site. The theme is gorgeous, light weight, and meticulously coded. 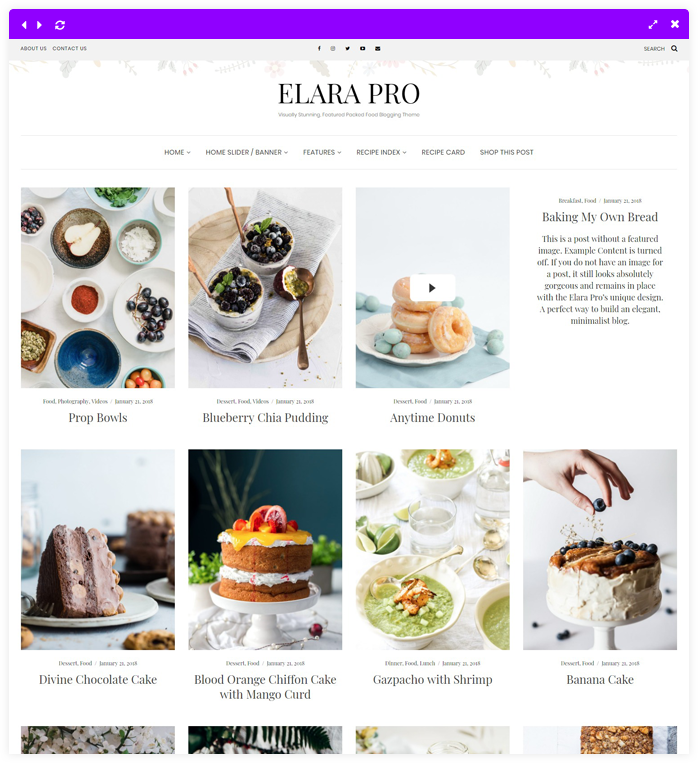 Backed by world class support from the LyraThemes team, Elara Pro is your one-stop theme for a creating a thriving food or lifestyle blog. 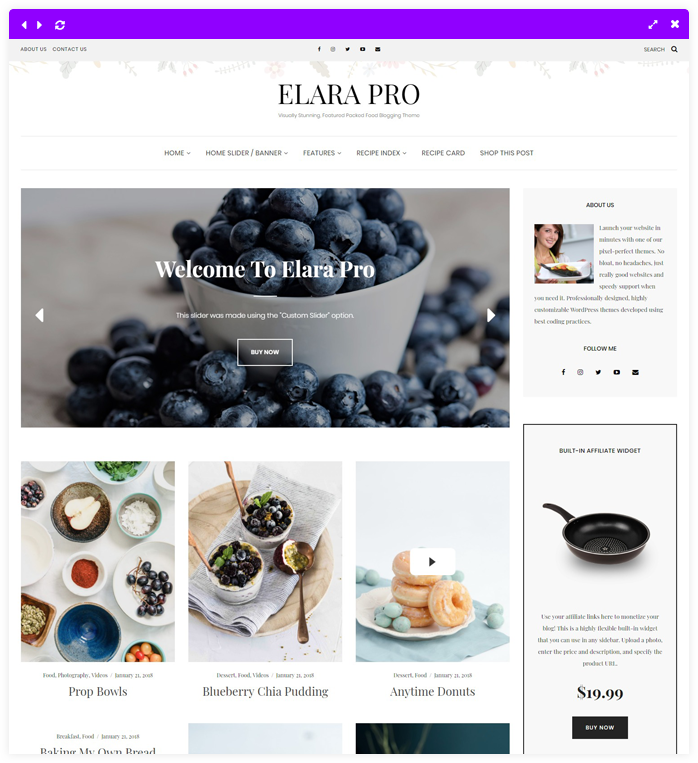 Elara Pro includes custom, speciallly made promo boxes that can be used on the sidebars or the home page. 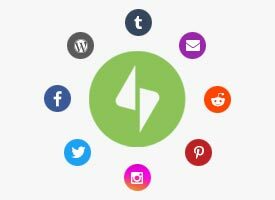 Promoting your affiliates is as easy as uploading product images and linking to your affiliate URLs! 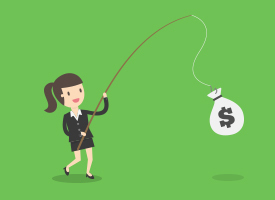 The ability to refer unlimited products in your posts gives you a powerful tool to monetize your blog and promote your affiliates. 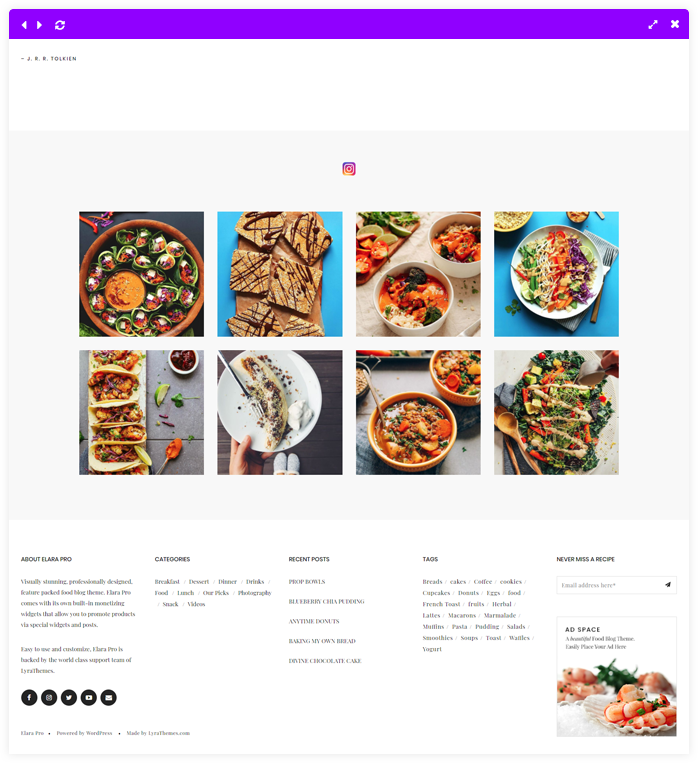 The theme comes with its own built-in recipe shortcode builder that uses structured data to make your recipes Google friendly. Not only does the recipe look beautiful, it will perform well with search engines. The Print option allows visitors to print the recipe cards. 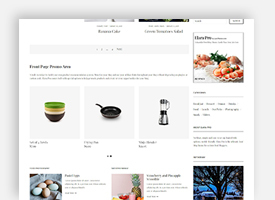 Want to display a beautiful list of recipes or posts by category on the same page? Want to allow filters for categories, tags, and dates? Use the Recipe Index template. 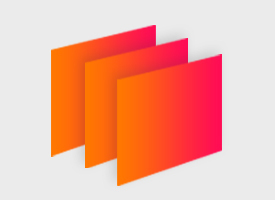 You can use it to create as many index pages as you like. Powered by Jetpack, get social media sharing right out the box with Elara Pro! The share icons are styled to match the theme and their placement can be controlled through the theme customizer. 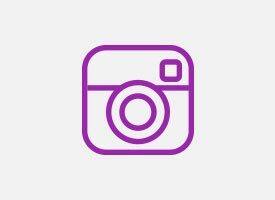 The WP Instagram Widget is a simple to use and easy to set up plugin that displays your Instagram feed. 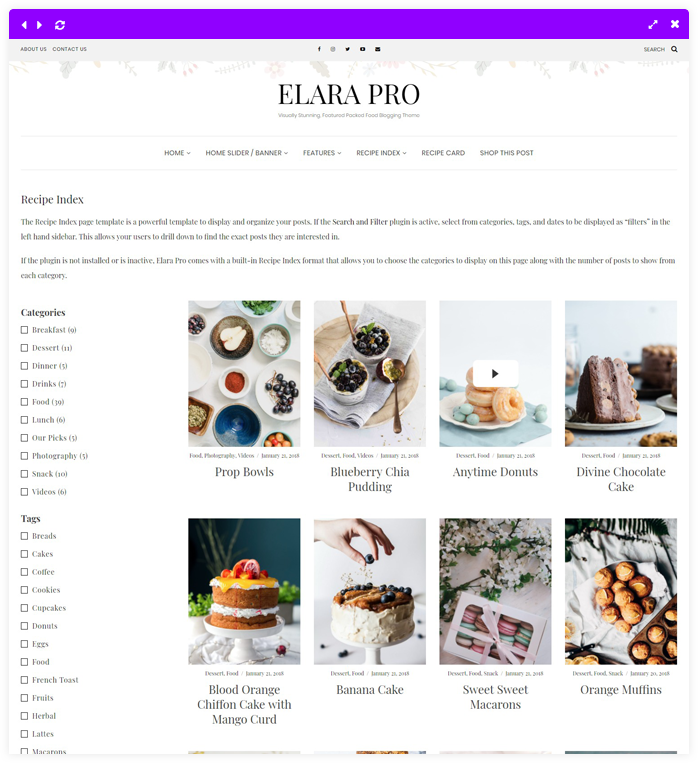 We've included styling for this plugin in Elara Pro so you can rest assured your Instagram feed will display beautifully and seamlessly. 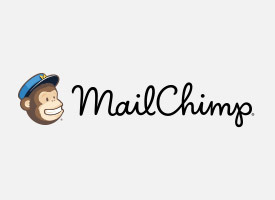 Set up MailChimp subscription forms easily using our custom widget! It comes built-in with the theme and you don't need any extra plugins. Simply drag the widget, enter the subscription list values from MailChimp and you're good to go! 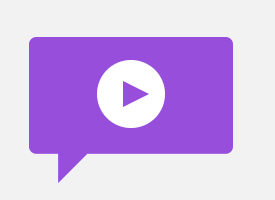 Create video format posts and specify a YouTube video URL to automatically show it in your blog feed ready to be viewed! Create your own look. 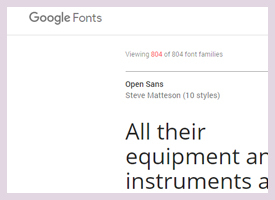 Choose from a large selection of available Google Fonts that are updated regularly. You can choose fonts for the logo, tagline, body text and headings - match your blog to your personality and style! Choose your own accent color! 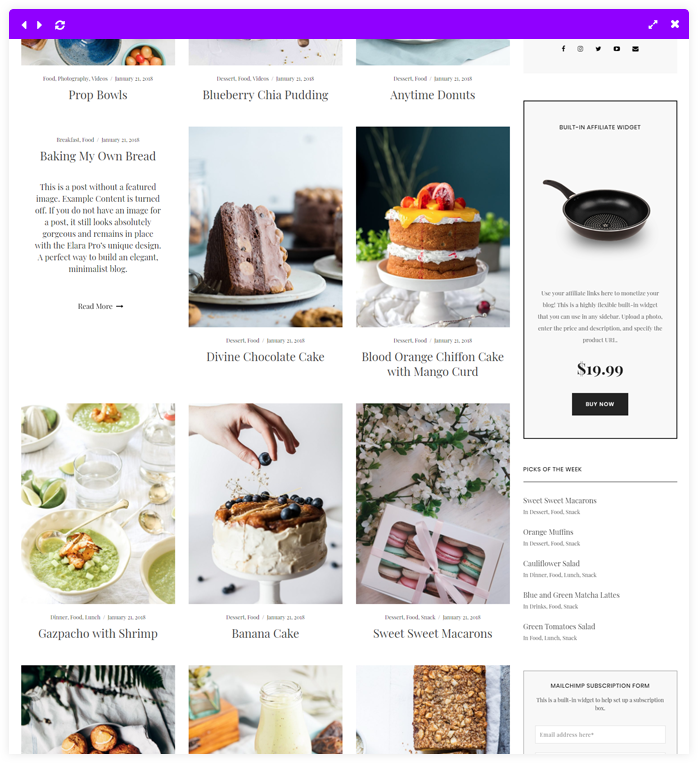 We believe the theme looks gorgeous as it is but if you want to change the colors to match your branding or style, you can do it in a couple of clicks! 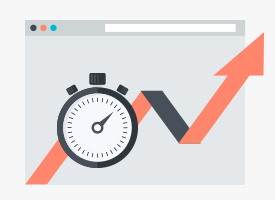 Elara Pro boasts lightening fast load times and clean code that is optimized for search engines, thus giving you an edge in rankings. 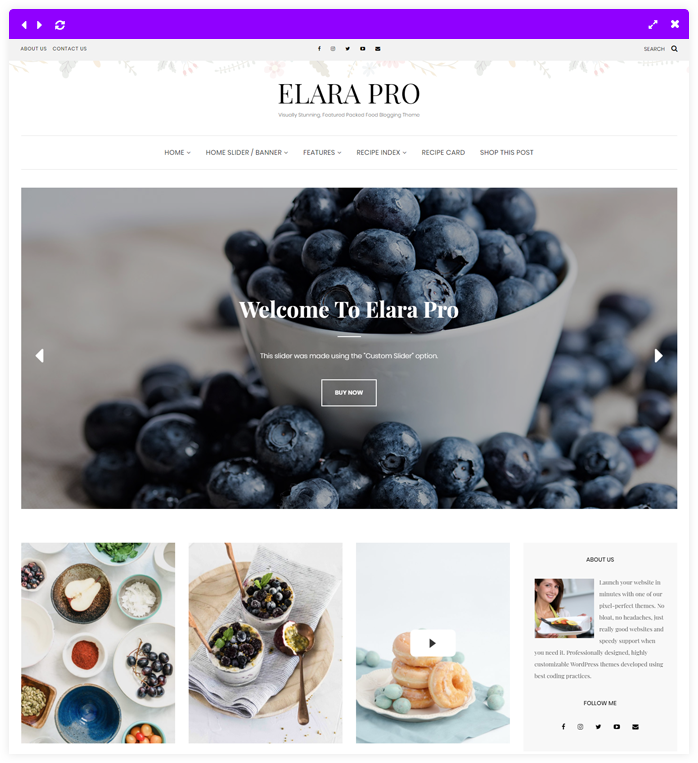 Elara Pro is super easy to setup and you can use our demo content to get started. You'll be well on your way in 30 minutes or less! You receive ongoing updates and fixes to the themes as long as you're subscribed. 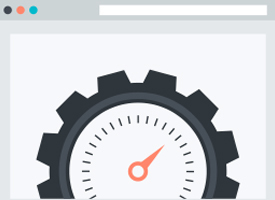 All our themes come with a comprehensive documentation and demo data that will allow you to set up your website to look like the demo site with a few clicks. 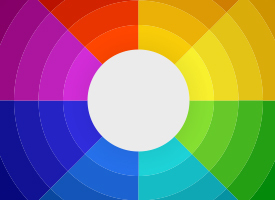 Pre-built color schemes handpicked by our designer or the option of choosing your own colors from unlimited options. *Not available in some free themes. All options of the theme can be controlled from the WordPress Customizer, keeping everything in one place and easy to setup and configure. Each theme comes with a selection of Google Fonts that can be used for font styling. *Not available in some free themes. Coded with search engine optimization best practices in mind. All our themes are fully responsive. The themes look great on tablets, mobile phones, and all size desktop monitors. The themes are translation ready and can be translated by using POEdit. All our themes come with the option to add your own custom CSS code to tweak HTML elements if needed. The Pro version comes with tons of useful extra features and functionality, along with regular maintenance and updates to the theme. It also gets you access to our super friendly support staff, who are all WordPress experts ready to help you get your website up and running. We take pride in our swift customer support and commitment to provide an awesome product, so join us and we'll help you make something great! Don't just take our word for it - read the most recent reviews here!